The last second team friendly match of 2019 saw Warwickshire making the trip to Northamptonshire. Always a match played in good spirits Northamptonshire Golf Club was this year’s venue. This course is a very fair test in beautiful surroundings, a cold grey start to the day weather wise but with a nice breakfast roll consumed and a warm up completed we were ready to start. Leading the way in the foursomes were Paul Walker (Maxstoke Park) and Lewis Phillips (Coventry). They started strongly but this was a match of high quality golf and two under gross through nine holes was only good enough to be all square at the turn. More good golf from Paul and Lewis early on the inward nine would see them take a two up lead into the very tricky last three holes. In keeping with their low scoring morning, two solid pars would see them be three under gross for seventeen holes and able to close the match out two and one. Playing in match two was Stuart Bloxham (Hearsall) and Dan Bardsley (Moor Hall). They would start well and soon get into the groove playing sensible golf and in making very few mistakes. This approach was working a treat and they would be four up with four to play heading down the fifteenth. A spirited fightback from the Northamptonshire pairing would see that lead halved to two, but a steady par on the tricky seventeenth hole would see the Warwickshire pair home and dry with a two and one victory. 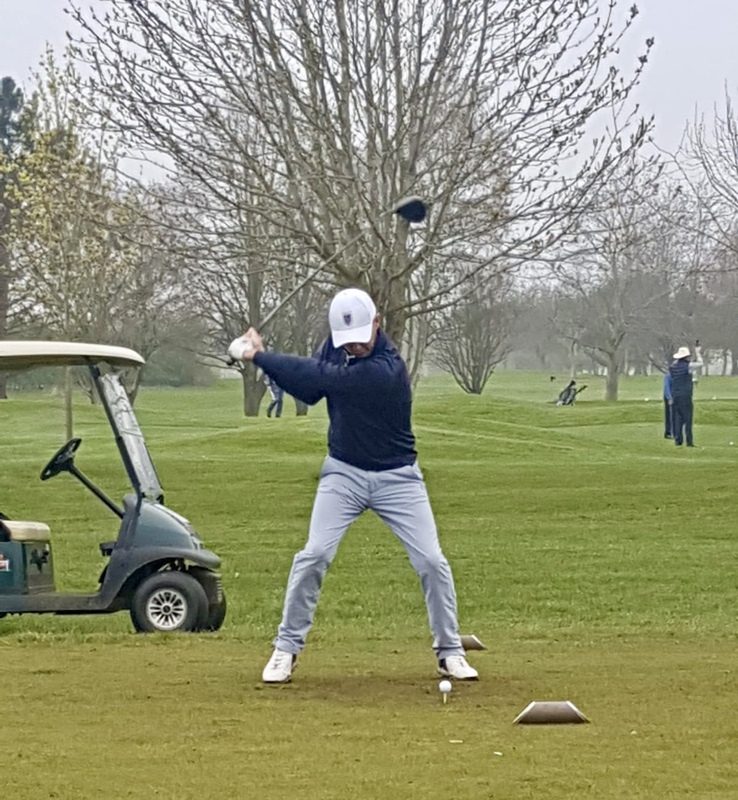 Match three was Cameron Bridger (Marston Lakes) and Chris Staite (Robin Hood) and despite a lost ball off the tee on the very first hole, the Warwickshire pair would make several birdies on the front nine to turn level. Into the back nine and a few loose shots saw the Warwickshire pair fall behind and despite battling hard, a tee shot finishing through the fairway on seventeen would be their eventual undoing. Losing out two and one. Match four saw Ben Goodison (Coventry) and Nev Gardner (Stoneleigh Deer Park) fall behind early in the round resulting in them being four down after ten holes. A three hole winning streak saw Warwickshire get back to just a single hole deficit but the Northamptonshire pair were resolute and closed out a deserved three and two victory. So, the scores were tied two each at lunch and it was all very much to play for. 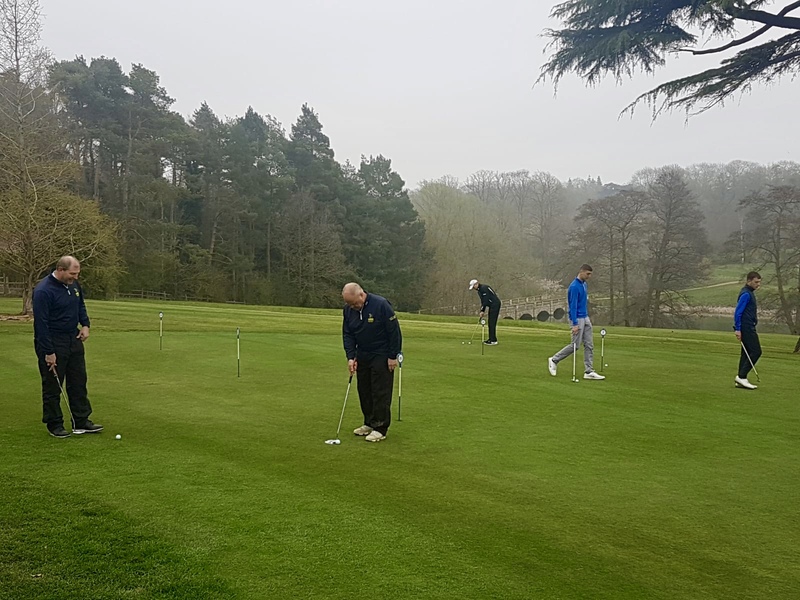 Both captains had the opportunity for a good think about the order and with the line-ups confirmed, it was all set for a good afternoon of singles match play. Stuart Bloxham led the team out and he carried on exactly where he left on from the morning, not missing a shot and remaining fully in control of his game and his match. Two Birdies and not a single drop shot in the afternoon would see Stuart close his match out four and three. As good a first team captain as Stuart was, it is great to have him back as a player. In the second game Lewis Phillips was also a man on a mission. Two under par and one up standing on the tenth tee he would have 120 yards in from the fairway. Mark Reynolds (Warwickshire’s President Elect) and I stood by the green were treated to a holed wedge, which pitched barely an inch past the hole and after a single bounce ended up in the hole. A further birdie on the way home would ensure a four and two win to close what was a very low scoring match. Well played Lewis. Next was Paul Walker and he would start well and take an early lead only to be pegged back by some good golf from his Northamptonshire opponent. Going one down after a rare bogey on ten Paul then found the fairway bunker on eleven to go further behind. Paul battled hard but his opponent did not wish to be caught. The match would end in a two and one defeat for Paul. A similar story for Cameron Bridger as he too would lead early on but be pegged back around the turn. All square after thirteen Cam would lose two holes in succession and would run out of holes to lose two and one. With match scores now level again, it was down to the last four to decide the result. Dan Bardsley started on fire; early birdies would see him take a three up lead after five holes. This would be extended to five up after nine holes. Fully in control and not making any mistakes, he would close out the victory with a seven and five win. A maximum point return for the day and a great start on his return to County golf. Well done Dan. Chris Staite was next and this game was nip and tuck throughout the afternoon. Never much in it this would be decided over the tough last three holes. A great tee shot into sixteen would see Chris go one up and a perfectly played seventeenth would see Chris seal a two and one victory. Warwickshire now had the six points for the halved match, could the last two get the needed half point to win the match? Nev Gardner was playing at number ten, but would finish his match before Ben. Some good shots and great up and downs but a few too many missed putts combined with a very good opponent meant a four and three defeat for Nev. This left Ben Goodison last out on the course and throughout the afternoon he hit plenty of quality shots but just wasn’t getting the rewards. When the odd bad one appeared, he was punished to the maximum. Being two down with two to play Ben bravely won seventeen to take the match to the last. The eighteenth at Northampton Golf Club is a drivable par four but with out of bounds tight on the right and a large run off to the left it’s an extreme risk and reward hole. Ben with the honour hit a good drive just to the left of the green but not down fully into the run off area. An honourable word here for Jordan Darnell from Northamptonshire. With it all on the line he stood tall on the eighteenth tee and hit the perfect drive to within ten feet of the hole. A truly remarkable and classy shot in the circumstances. Ben’s chip would not find the cup and the match would be lost two down. The afternoon ended in a four all tie and the overall match score was a six all tie. This does feel about the right score for a fixture as close as this one was. My congratulations to Chris and the Northamptonshire team for a well played and enjoyable match. I wish you all the very best for the season ahead. Thank you to Northampton Golf Club for allowing us the use of the facilities and or looking after the team so well with great meals and a fabulous half way hut. A personal thanks from myself and the team to Mark Reynolds for his support during the day. I promise (hope) the weather will be warmer in later matches this year. Our next match is at Maxstoke Park against Shropshire and Herefordshire in May. With one defeat and one tie in pre-season, here is to hoping we complete the set with a win in this one.